Alnwick Town can confirm that Adam Laidlaw has resigned as first team manager this week. His resignation follows on from Saturday’s 7-1 away defeat at Ryhope CW. The club would like to thank Laidlaw for his efforts and time at the club, and wish he well for the future. Laidlaw said on Twitter, “Regrettably I have to announce that I have resigned as manager at Alnwick Town. Steve Mullen will take charge of first team affairs until the end of the season. Shilbottle suffered their third cup defeat in consecutive weeks, once again by the odd goal, in this rearranged Combination Cup tie. The game was switched to the Welfare Ground at short notice due to a waterlogged pitch at Wallsend. The Colliers got off to a bad start on a difficult surface and fell behind after 15 minutes when poor defensive play allowed Nicky Whitelaw to shoot Wallsend ahead from close range. However, Shilbottle drew level on the half hour when Josh Hay broke clear to draw the keeper and flick the ball in to the corner of the net. The Colliers situation was not improved shortly after when their keeper, Sean Straker, had to leave the field through injury to be replaced by outfield colleague Ross Stewart. Liam Brooks shot wide from a good position and a Matty Graham header was just off target as the Colliers increased the pressure. 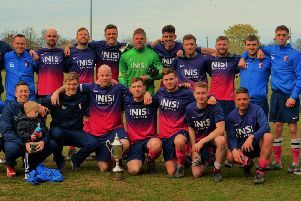 However, they were hit with a setback just before the break when Wallsend broke away for Nicky Whitelaw to put his side in the lead once again. The second half was one way traffic as the Colliers pressed for an equaliser. Josh Hay shot wide when well placed before Ross Moore had an effort well saved. Wallsend then had a player sent off as they battled to maintain their advantage. Shots were blocked on the line, Hay had a header well saved before a Brad McClelland header hit the bar, but Wallsend hung on to move into the semi-finals. * Also in the Northern Alliance, Alnmouth United picked up three points with a 2-1 home win over bottom of the table Whitley Bay BC Seniors.